In yesterday’s post about the principle of persuasion known as social proof (and how social proof relates to Internet user review systems), I left off with an illustration of how consumer reviews are implemented on two popular book sites, Amazon.com an AbeBooks.com. While both sites offer user reviews, Amazon clearly demonstrates a deeper understanding of how social proof and user reviews can compel people to purchase its products. Many of Chen’s research findings that I cited in yesterday’s post align perfectly with the design of Amazon’s popular product review system. That was books. What about higher ticket priced items such as hotel rooms? How are travel aggregator sites making use of social proof? 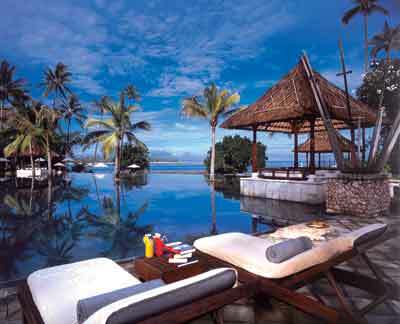 There are many more attributes of a hotel than a book – and there is also generally more at stake when it comes to making a vacation booking than buying a vacation book. 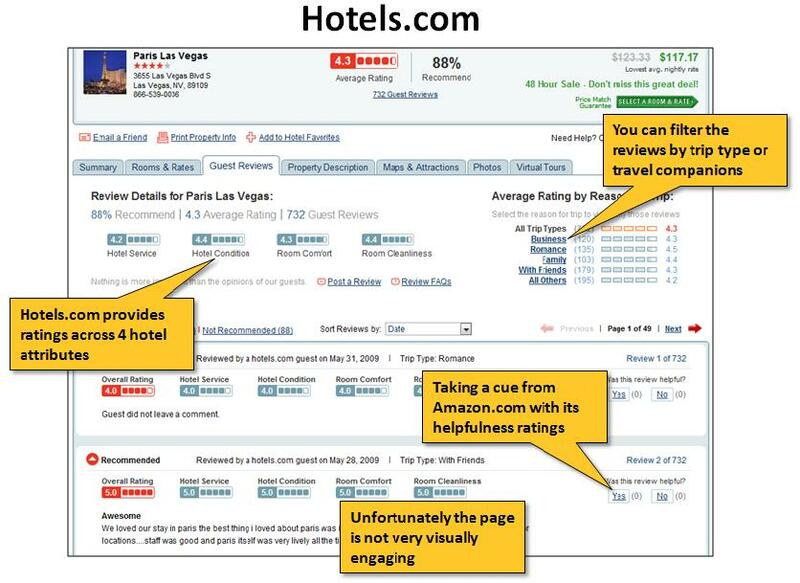 As a result, we see a lot of rich detail on hotel site user review systems. Hotels.com incorporates ‘guest reviews’ directly into its product pages and provides some nice features for drilling into what’s important to travelers when searching for a hotel property. Ratings for service, hotel condition, and cleanliness give visitors an additional layer of detail than a single overall rating. Reviews can be filtered by the type of trip you plan to take – which makes sense given that leisure travelers will likely have a very different set of expectations than business travelers! Travelocity.com positions its reviews as a ‘new’ feature. While perhaps late to the reviews game, the site designers have done their homework when it comes to allowing visitors to drill down into the information that matters most to them. A simple two-column layout and a surprisingly high number of reviews across the listed properties makes it easy for hotel searchers to get the information they need and feel confident in the overall assessments. 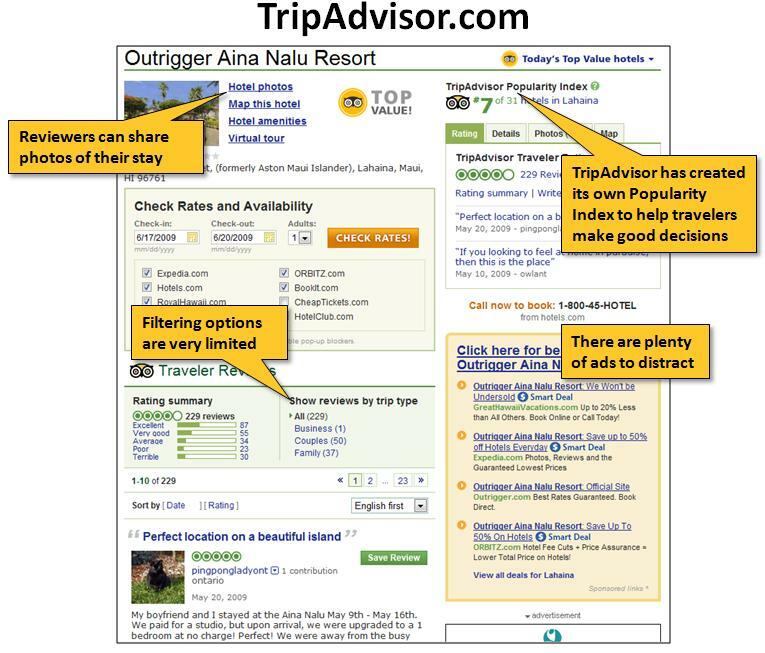 TripAdvisor.com was one of the first travel aggregators to offer user reviews. However, the site has not evolved at a pace one might expect on the Web, and a lack of in-depth review features generally means more work for site visitors – and the advertisements are a distraction from the primary goal of the page, which is to persuade users to book via great user-generated content. I’ve scored the 3 sites across 7 different dimensions to get a sense of their overall effectiveness and ability to persuade. I used a 10-point scale, giving equal weight to each persuasive element (this is subjective but it is my blog). The absence of a particular feature doesn’t necessarily translate into a ‘0’, since there may be a proxy for that missing element. For example, the ability to sort reviews by rating could be called a proxy for ‘Hotel Popularity’, but it’s not as elegant a solution. Photos, however, are an all-or-nothing element (i.e., it does mean ‘0’s for not having them). So how’d they do? There is no runaway winner because no site provides all of the persuasive elements — and they each tend to excel in different areas. TripAdvisor.com edges out the other 2 sites mainly because of its user-submitted photo feature, which I would argue is a highly persuasive element. 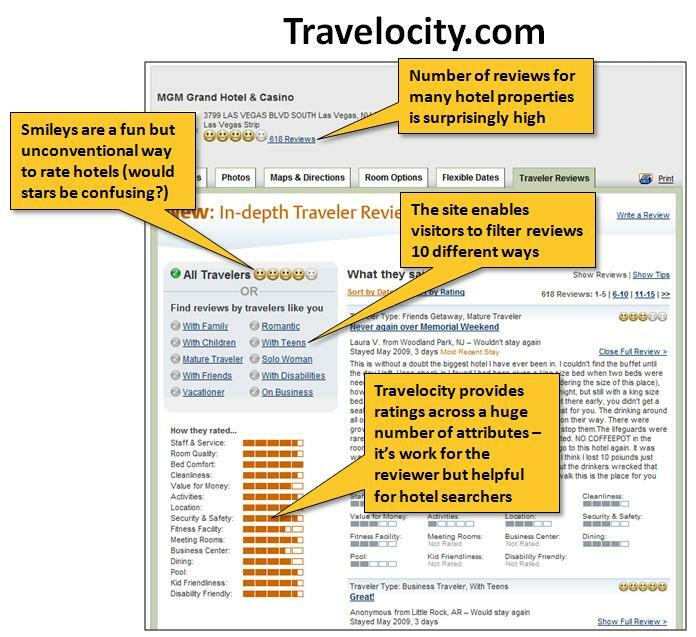 Travelocity misses with the absence of helpfulness ratings and Hotels.com lacks depth in the areas of filtering and individual attribute ratings. With their persuasive properties grounded in social psychology and plenty of research like Chen’s to support their continued use, consumer review systems are a unique value add on the Web. People have come to rely on the opinions of others for online and offline purchase decisions, and I suspect that without them we would feel lost. But that is an unlikely scenario… so long as people continue to take the time to provide their opinion.